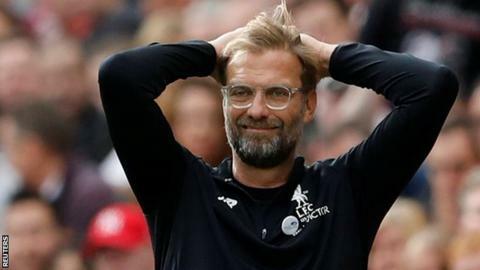 Liverpool finishing in the top four of the Premier League would represent progress for the club, says former Reds midfielder and manager Graeme Souness. The Anfield club, who were fourth last season, are 12 points behind leaders Manchester City after losing at Tottenham on Sunday. "Knowing how competitive it is now, I'd see being in the Champions League again next year as progress," said Souness. "You look at Man City and how can they compete with them financially?" Manchester United, Tottenham and Chelsea make up the rest of the top four, with Liverpool ninth. Speaking to BBC Radio 5 live's Sportsweek before the 4-1 defeat by Spurs, Souness added: "I don't think they will win the league any time soon. "As a supporter, I will be happy if they end up in the Champions League because that is how you attract better players and grow the club." Liverpool manager Jurgen Klopp succeeded the sacked Brendan Rodgers in October 2015 but missed out on silverware when the Reds lost the finals of both the League Cup final and the Europa League in 2016. "He's got to start winning trophies and he knows that," added Souness. "That's why he was hired. "There's a lot to like about him but he's been there a couple of years now and when you spend money the expectation and pressure comes. "He'll know what he's got in the dressing room and he'll know he's got a bit to go with those players."